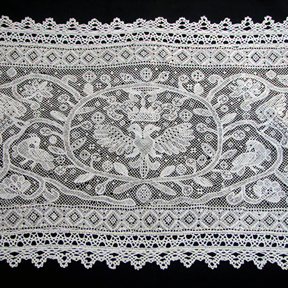 The scale of the lace is quite amazing, the design overflows with flowers, figurals, animals, and the two-headed eagle, a motif that was very popular in early laces. There are five ornate figurals near the heading, surrounded by meandering boughs and flowers, with aimals amongst the boughs. Five two-headed eagles are at the top of this elaborate tree, possibly symbolic for the "tree of life". The skillful needlepoint is amazing, the design so absolutely rare! Well worthy to be in a museum. Rare and superb 19th C. Lacis panel with a central oval vignette containing the two-headed eagle with a crown on top. Mirror image birds surround the vignette and there are winged cherbim amidst the meandering branches and flowers. The Lacis is surrounded by bobbin lace. Large elaborate mythological birds and ornate trees are worked into the design. 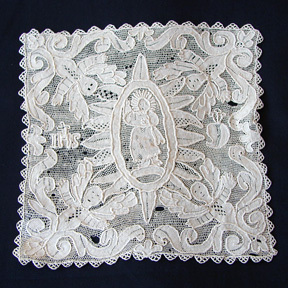 The whitework design is influenced by the style of Rococo that was so popular at the time. The arching branches, interesting florals, and playful birds are quite delightful. 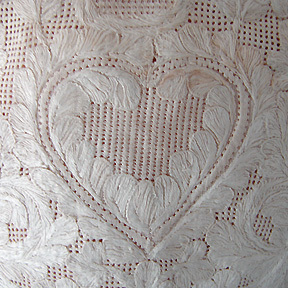 Various embroidery stitches have been used throughout the whitework. 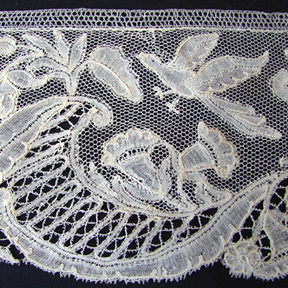 A superb piece for the early lace collector. Superb design and workmanship on these lovely lappets. 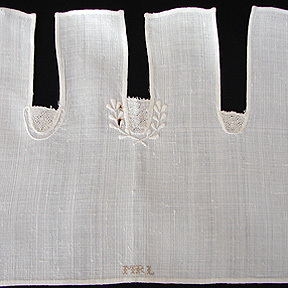 The flax used on these lappets is so very fine, they are as light as a feather. 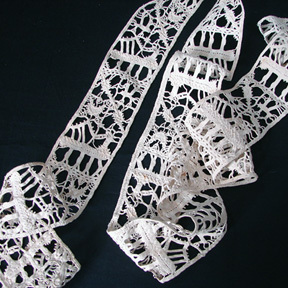 It is quite astonishing that lacemakers were able to create such amazing lace. A exceptional border of fine Point De France with a ornate design of fine vases, meandering vine, flowers, and leaves throughout the lace. The design and quality of workmanship are quite exquisite. Museum quality! A rare and wonderful Venetian needlepoint chalice cover or small cushion cover. The figural in the oval is probably Jesus with a halo surrounding his face, and four Cherubim are worked in the four corners. 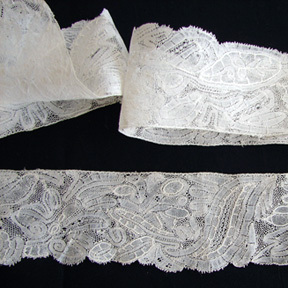 Pieces of lace like this are usually only found in Museums or important private collections. A superb piece! 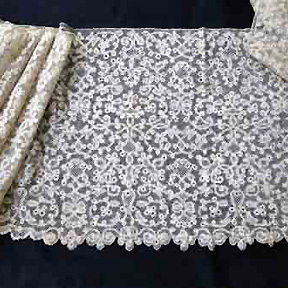 Circa early 1700's, a very beautiful Valencienne lace lappet with a magnificent design and exquisite workmanship. The design is rich and full, with graceful arching flowers and leaf designs. Numerous decorative fillings and a fine reseau of "cinq trous". In order to produce such a gossamer fine texture, the linen flax thread was spun in a damp place. The light would have had to be quite dim with one ray of light shining on the thread that was being spun. A gorgeous design, superior thread and workmanship. A fine bobbin lace capback dating fromthe 18th C. A central large vignette has a floral design with large flower heads and meandering vines threading their way around the outer design. A rare 18th C. French Argentan needle lace with Argentella "Spider" fillings. A superb piece with a heavilly encrusted design of ornate urns overflowing with flowers, tall potted plants, and various shaped butterflies. The quality of workmanship is quite excellent, the design exceptional! A very rare piece that is worthy of a Museum, or for the serious collector. A very rare matching Dresden work apron and matching shawl. The dense design of large stylized flowers and leaves is enhanced by ornate drawn-thread fillings in the intricate design. A wonderful item for museum collection. 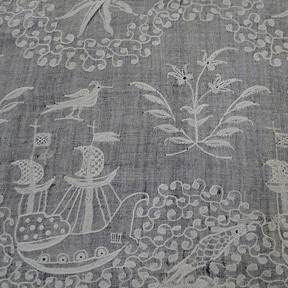 Rare 18th C. Whitework w/ Ships, Birds, Fish, etc. 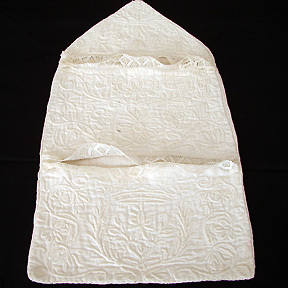 Circa 18th C., a extremely rare design on this whitework shaped capback. A most amazing scene of galleon ships, large fish, birds, garlands, and florals. The design of scrolling sea is quite impressive! Possibly not a capback at first, lace so rare would have been preserved and used in other ways. A rare exceptional piece for early lace collector. A wonderful border of potten kant lace with a ornate design of large urns overflowing with flowers and leaves. The urns and flowers have delicate fillings. 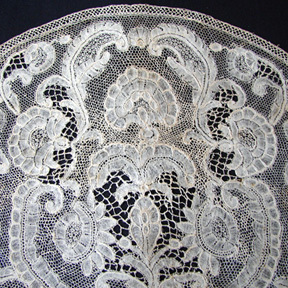 A lovely piece for the early lace collector. 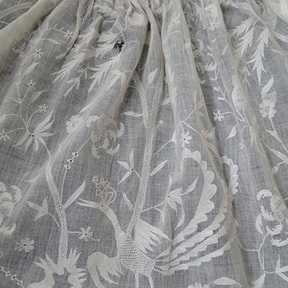 Circa 1700's, a lovely wide flounce of flemish lace worked with very fine thread. Measuring apprx. 95" by 16" wide, or 241 cm by 41 cm. In good condition..
A very highly embellished French lace capback. The design is ornate with a central urn or vase overflowing with flowers and assorted florals and leaves.throughout, with raised veining throughout the capback. A rare 18th to early 19th C. cord quilted "Huswife". Possibly Swiss, the design is elaborate with dense work. The workmanship is fine and is beautifully executed with fine linen that is very cool to the touch. The back is plain linen with the initials "TG" embroidered in red. 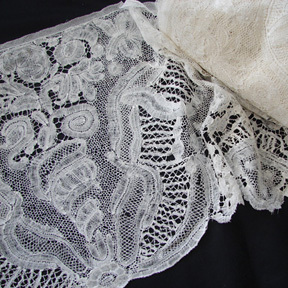 Handmade torchon lace have been added to the pockets. Circa early 19th C., this lovely bonnet seems like it might possibly have been got a child. Mothers and young children wore day caps and it is said that children wore caps until they lost their teeth. Amazing embroidery on this bonnet, with a dense and ornate design. A central heart is surrounded by large florals and leaves. Embroidered in satin stitch on a drawnwork design, with a pleate lace edging around the design. 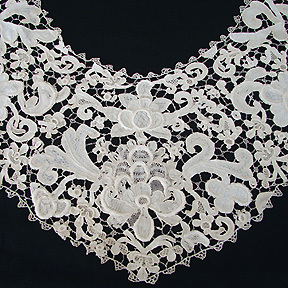 Circa 17th to 18th C., it is quite rare to find a original collar! The design matches on each side, with the traditional large florals with padded raised work on the flowers. The florals and leaves have assorted needlepoint fillings throughout. Circa 1740, a fine Brussels lace capback with a large central urn overflowing with flowers, elongated feather plumes, and fine meandering vines and leaves. The capback is as light as a feather, the fine thread was spun usually in a barn, and the lacemaker had a single light source shining on the thread as it was spun. 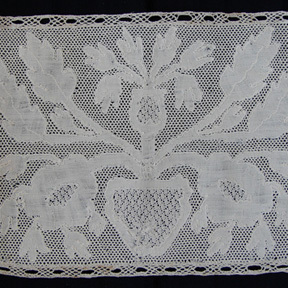 A rare Devonshire bobbin lace border with a very ornate design of flowers and scrolling leaves. Measuring apprx. 55" by 1 3/4" wide. 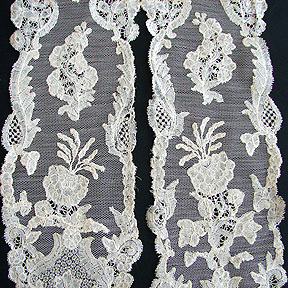 Early English laces are quite rare to find. In mainly overall good condition, but there are some openings in the lace. A fine bobbin lace lappet with assorted floral bouquets and scrollwork in the design. 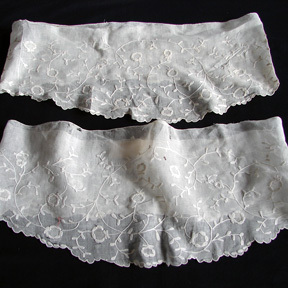 Lappets were a important part of a ladies attire during the 18th C. Measuring apprx. 48" by 3 1/2"
A beautiful and fine design on these joined lappets. The design is elegant, with fine elongated and scrolling flowers and leaves. 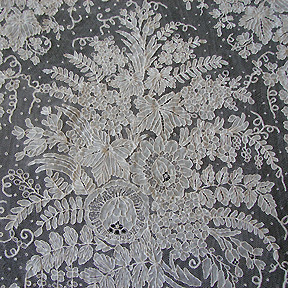 The designs on theses early lace pieces were influenced by the superb silk designs of the period. 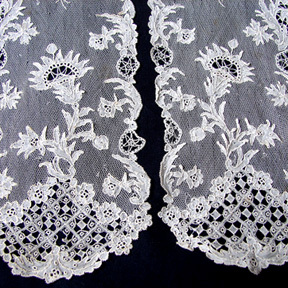 Lace lappets were a major item of apparel for most of the 18th Century. Ladies were not only able to exhibit their wealth but also their elegant taste. 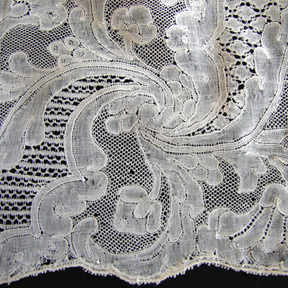 Superior threads, design and workmanship on this early 18th C. lace lappet. The design is extremely elegant with fine ethereal large floral bouquets and oval vignettes of flower and leaf designs that are filled with the finest needlepoint fillings. The fine flax threads are light as a feather. Superior design and workmanship on this lovely lappet! 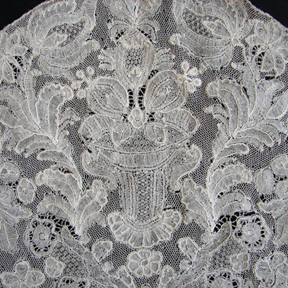 A early Flemish lace that is part of a superb lace collection we purchased recently. This seems to be either 17th C. or 18th C., the design seems to be in the Baroque style, with swirling flowers and leaves throughout the lace. Measuring apprx. 130" by 4" wide. A fine lace for the early lace collector. A rare pair of ladies engageantes with a highly decorative design. Delicate flowing vines, flowers, and leaves meander across the fine muslin. There is a tag attached which gives the provenance, they belonged to a "Mrs Jane Biodulph". This engageante or sleeve ruffle was a important costume accessory during the 17th - 18th C. Always extremely rare to find. A wonderful addition to a early lace or costume collection. A early ladies or child's Valencienne lace bonnet or cap. This came from a estate with mainly early Valencienne lengths, so it is possible that is was worn by a lady or child on the back of their hair, with long streamers of lappets at the side. Caps and lappets were extremely fashionable in their day! 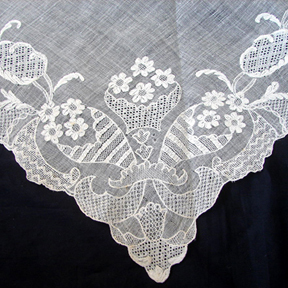 The finest Valencienne lace, a lovely design of elongated leaves and flowers. 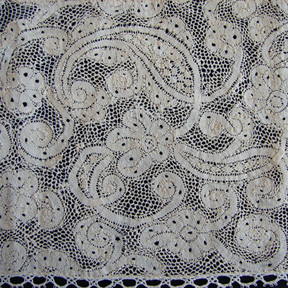 A early piece of lace that is truly beautiful! 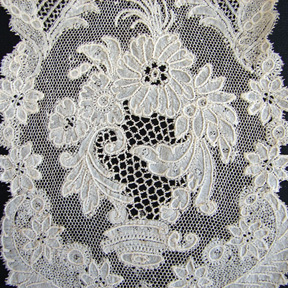 Lace like this can usually only be found in Museums or in very good private collections. The ground of "Vrai Druchel", the handmade net grounds that were usually used in early laces is further enhanced by a assortment of butterflies, birds, and lovely vignettes of musical instruments. The work is quite excellent and the design is outstanding. 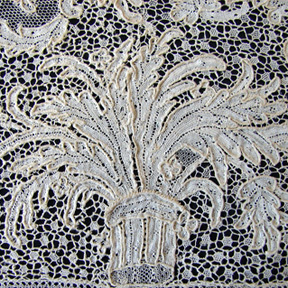 This lace came from a important private collection. 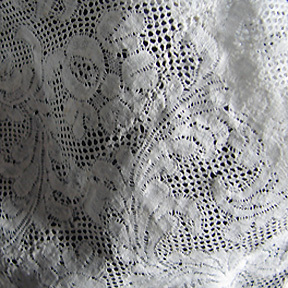 A Museum quality lace! Circa late 18th C. to early 1800's, a lovely Argentan lace capback. The design os quite elegant with tiny needlepoint florets throughout and a lovely garland of flowers. Measuring apprx. 9 1/2" by 8 1/2" wide, and in good condition. 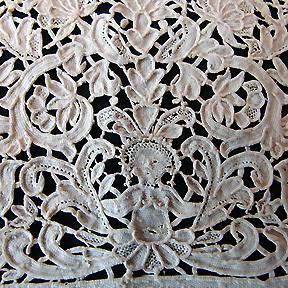 Circa 16th-17th C., a very rare and early Italian lace that is possibly a sampler. There are apprx. 17 aasorted rectangular designs with small hearts and assorted other designs. Fantastic work, and a very rare lace! 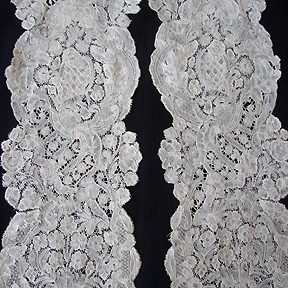 Lovely early fine Brabant lace panels measuring 530" in total. There are four pieces of Brabant lace with a ornate design of large floral bouquets, conch urns, and decorative florals and scrollwork. 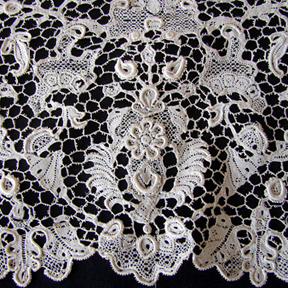 Circa 1600's-1700's, Brabant lace was used often for clothing, textiles, and favoured much by the church. 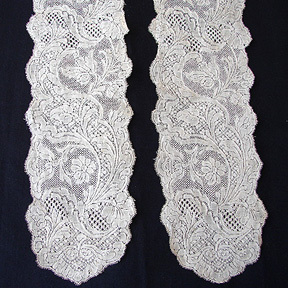 A superb and rare pair of Alencon lace lappets. The design is quite beautiful, with a fine trellis like design and flowing vines and flowers. 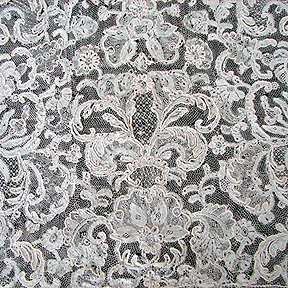 The ground on the lace is so very fine, it is almost hard to believe that it is handmade. A superb item for the collector. 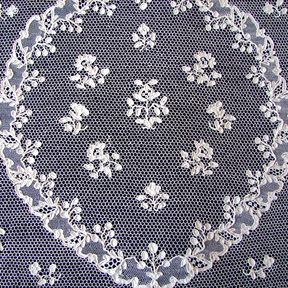 Circa 1860's, a superb design on this Brussels Point De Gaze lace panel. The design overflows with large floral bouquets, lovely garlands of vines, flowers and leaves, and beautiful undulating vine tendrils that meander gracefully throughout the lace. Almost entirely worked with scattered Point De Esprit throughout. A beautiful design and excellent workmanship.